Worthignton home sales were up 34.1% in the month of April 2010, from April 2009. The graph shows homes for sale and homes sold for the past 15 months, for single family homes in Worthington schools. The Worthington City School District includes neighborhoods in Worthington, Columbus, the Village of Riverlea, Perry Township and Sharon Township. The red line shows “sales pending” see info below about sale pending. I usually would not show it but because of the April 30, 2010 deadline for buyers to have homes in contract I am interested. I don’t necessarily believe it is accurate. The pended sales were down 43.9% in comparison to April 2009. April 2010 home sales (closed sales) included homes in City of Worthington neighborhoods such as Colonial Hills, Kilbourne Village, Old Worthington and Worthington Estates. Home sales in neighborhoods in unincorporated areas in the Worthington City School District including Brookside Estates and Worthington Hills. Home sales in Worthington as in the entire US were subject to a home buyers tax credit as long as the qualified buyer had the home in contract by April 30, 2010. 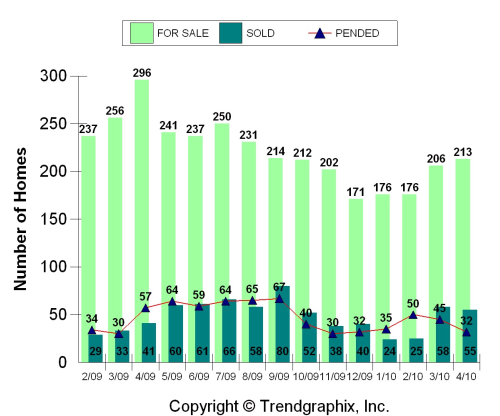 The pended sales were down 43.9% in comparison to April 20009. Personally I think sales were not turned in and that will go up by the time the Columbus Board of REALTORS releases numbers later in the month. Published May 2010 based on data available from the Columbus Board of REALTORS® at the end of April 2010. TrendGraphix reports presented are based on data supplied by the Columbus Board of Realtors. According to Trendgraphix neither CBR nor their MLS (multiple listing service ) guarantee or are in anyway responsible for its accuracy. “Information deemed reliable but not guaranteed.” Me neither. If you use the Worthington homes for sale link you will search the online inventory of homes in the Worthington school district on the Real Living HER site. You will be offered the opportunity to receive listings directly from the Columbus Board of Realtors MLS (multiple listing service) in real time. You can know the true status of the properties you are interested in. Next post: Columbus Locksmith or Internet scam?